Four days in and SA’s Emergency Relief contingent has already had an impact in the far north Queensland town of Cannonvale, near Mackay. 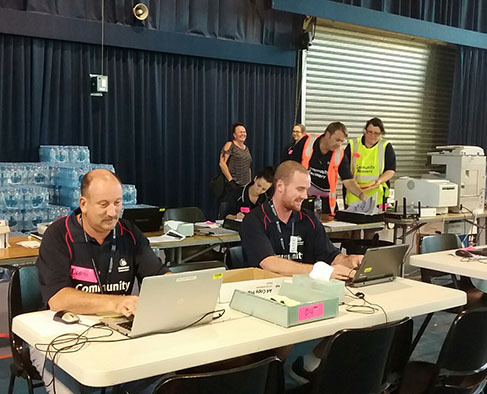 The team has been providing a wide range of assistance to people affected by Cyclone Debbie, including helping at a relief hub set up in a school gym, and performing outreach services going door-to-door in the community. Housing SA Senior Emergency Management Officer Tara Kennett said while the destruction from Cyclone Debbie was evident, the work had already been rewarding. “There have already been some people who have really required assistance and left with so much more than what they came in with,” she said. Meanwhile, deployment coordinator for South Australia Fiona Curnow (also a Housing SA staffer) said although the temperate and humidity were hard to adjust to, everyone was in high spirits. “We walked in on Monday and were so incredibly welcomed, they can’t stop raving about us being here and the Northern Territorians who started here on Wednesday,” she said. “The camaraderie and partnership between everyone involved has been outstanding. “We’ve had fantastic opportunities to learn from our interstate counterparts and will bring those learnings back to SA. All 17 South Australian staff in Queensland self-nominated to be involved in the recovery, meaning that they will spend the Easter weekend away from family and friends. The group is due back in Adelaide on 22 April.